Click photo to download. Caption: From left to right, New York Mayor Ed Koch, Congresswoman Bella Abzug (D-NY) and President Jimmy Carter during a meeting in 1978. Credit: White House. “Mayor Koch last night took on the ghost of President Franklin D. Roosevelt,” an item in the New York Daily News in 1988 began, which probably surprised no one, since Ed Koch had spent a lifetime taking on everybody who deserved to be taken on, whether they were alive or dead. Indeed, his willingness to vigorously battle for what he believed, and let the chips fall where they may, was precisely what endeared Koch—who died Feb. 1—to so many people across the political spectrum. Click photo to download. 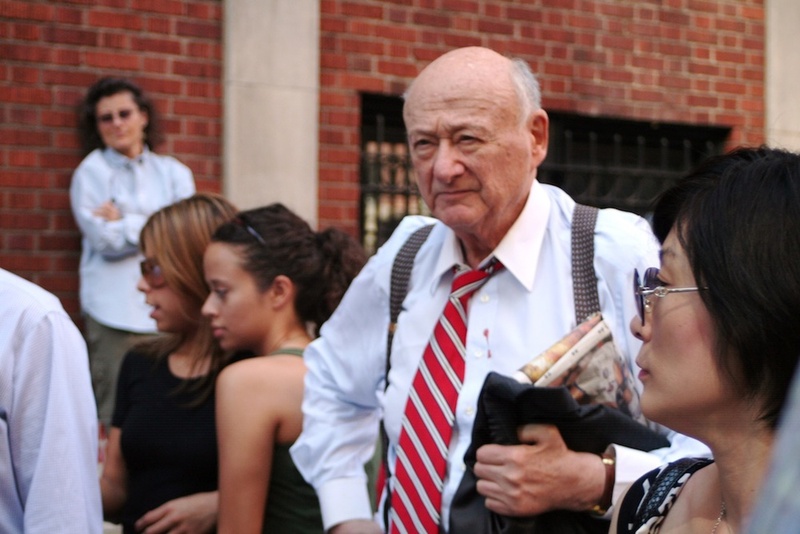 Caption: Ed Koch in 2007. Credit: Boss Tweed/Wikimedia Commons. President Roosevelt “did many, many good things,” Koch emphasized, recalling FDR’s role in “saving the United States from the Depression” and leading America against Hitler in World War II. But FDR “also had an opportunity to save Jews before World War II,” and his failure to do so is what landed him in purgatory, Koch explained. He cited Roosevelt’s decision to turn away the refugee ship St. Louis; his refusal to instruct the State Department to permit Jewish immigration up to the maximum allowed by law (the quotas were woefully under-filled); and the sham Evian Conference of 1938, which the Roosevelt administration convened to give the impression of concern for the Jewish refugees without actually doing anything to aid them. Click photo to download. Caption: Ed Koch. Credit: Provided photo. For me, however, perhaps the most significant part of the interview was Koch’s analysis of anti-Semitism in the U.S. in the 1930s and 1940s. Given the public mood in those days, was it politically possible for FDR to have done much for the Jews? Scholars looking at this issue tend to rely on newspaper reports, public opinion polls about prejudice, and statistics about the size of anti-Semitic organizations. But an eyewitness account can be very revealing. And Koch, having grown up in hardscrabble neighborhoods in Newark and Brooklyn in the 1930s and 1940s, had much to say about the subject. What about claims that helping the Jews would have undermined Roosevelt’s ability to convince the public to fight Hitler? “I don’t accept that,” Koch said. “I believe that the American public could have accepted saving Jews.” Koch wasn’t a sociologist. He just knew what he had experienced among the people he met in the neighborhoods where he lived and worked. Some were bigots, but most weren’t. Koch wasn’t just speculating when he expressed his faith in the basic decency of most Americans. In April 1944—while the Holocaust still raged, and before the deportations of Hungarian Jews began—the White House quietly commissioned a Gallup Poll on the subject. It asked the public about offering “temporary protection” to Jews fleeing Hitler. The “anti-Semitic” American public supported the idea by a margin of 70 percent to 23 percent. Despite that overwhelming public sentiment, President Roosevelt agreed to create just one refugee camp—in upstate New York, where 982 refugees were brought in the summer of 1944. Click photo to download. Caption: Dr. Rafael Medoff.Dr. Rafael Medoff is founding director of The David S. Wyman Institute for Holocaust Studies. Posted on February 3, 2013 by Rafael Medoff/JNS.org and filed under Opinion, U.S..